The floating bathroom vanity is the new vessel sink. Bathroom trends come and go, but the essential elements of the bathroom are forever: sink (with or without a vanity), toilet, shower and/or bathtub. Extra touches such as a bathroom backsplash or bathroom floating shelves are aesthetic and practical bonuses, while iterations of bathroom basics (see the on-trend exposed shower system or creative bathroom tile installations) offer some creative freedom for bathroom renovators. This is where the floating bathroom vanity comes in. Floating bathroom vanity ideas are a growing bathroom design trend that helps reduce the visual weight of the bathroom vanity and sink. Some sinks stand alone, without a vanity, while others are embedded in or placed on a countertop vanity. Conventionally, this hand- and face-washing spot is rather large, with a bulky base that often has space for storage. 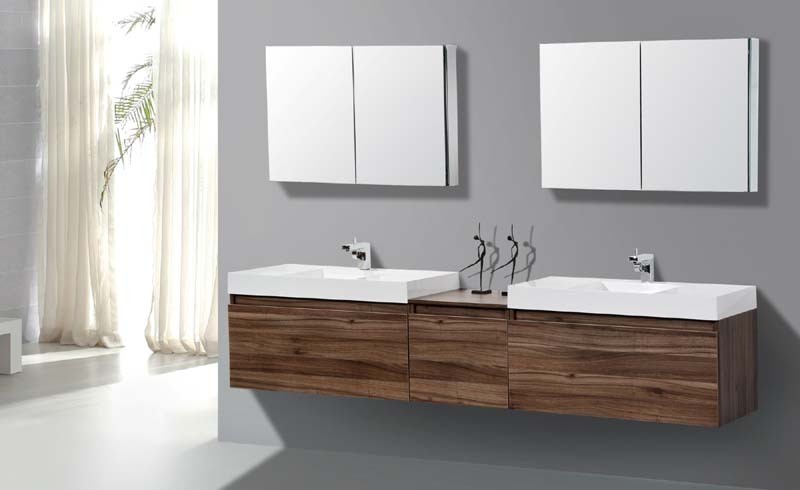 More elegant sinks and vanities have thin legs and an open base, but the new look eliminates that by attaching sinks and vanities to the wall, with no support structure beneath. Floating bathroom vanities and sinks can cut down on storage space, but some versions—especially floating vanities—still have built-in cupboards or drawers. Floating vanities also often offer some counter space, while floating sinks are more pared-down, with little-to-no counter space. (Many floating sinks are used in smaller bathrooms.) With no heavy weight beneath them, floating vanities feel lighter and more contemporary; the open space beneath offers a visual break, especially in high-impact bathrooms. In some bathrooms, the space underneath a floating bathroom vanity can be used for storage with the addition of bathroom shelves or curated baskets. Floating sinks have a more industrial, natural look, as the plumbing is often exposed, though floating sinks without exposed plumbing have a very streamlined, modern aesthetic. The best way to decide between a floating vanity or a sink is to consider how much storage and counter space will be needed. 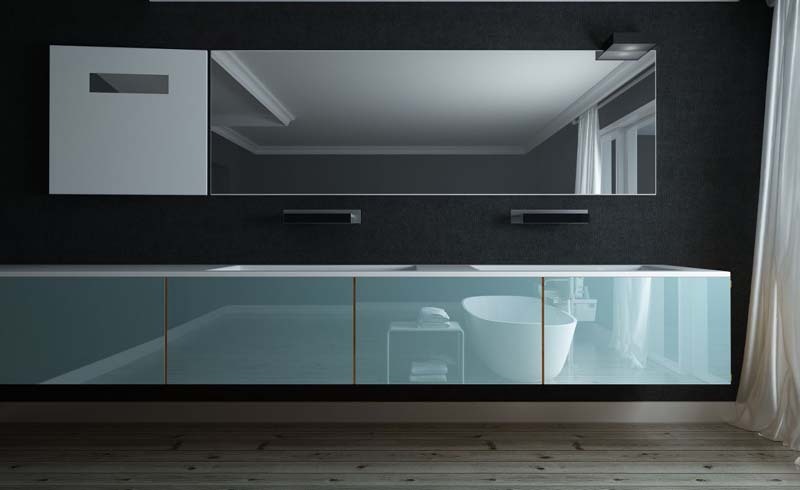 The floating bathroom vanity ideas below prove that the look is supremely dynamic. It can fit into bathrooms of any style: minimalist, modern farmhouse, luxe, industrial, whatever. Scroll on for the proof … and plenty of picture inspiration. A basic trough sink with multiple faucets is prime minimalist industrial–style. A cohesive color scheme for the sink and other bathroom elements helps an unexpected floating sink variation fit neatly into the space. In a modern, mostly-white bathroom, a pop of natural wood in a floating vanity pops in the space without feeling out-of-place. In a polished marble and tile bathroom, a raw wood vanity serves as a curated focal point. Storage baskets underneath offer some artful utility. An industrial floating sink is pairs nicely with industrial decorative accents, a simplified color scheme, and useful decorative storage ladders. In a modern farmhouse bathroom (hi, shiplap accent wall and bare-bulb light fixtures), a gray floating vanity with drawers offers useful storage.